Main Stories: From the human grave in Mannar up to now 239 human skeletons have been recovered and many more skeletons have been reported. Mannar is undergoing supervision over the 109th day of Mannar Magistrate T. Sarawanarajah today. 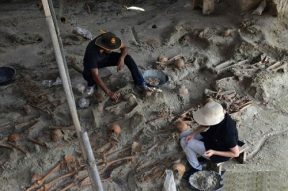 Excavations are undertaken jointly by the legal medical officer Saminda Rajapaksa. The area where the excavation works are expanded and the human skeletons are observable in the area. It is noteworthy that continuous irrigation works are being carried out by rainwater from the excavation work area.